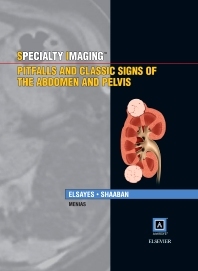 Specialty Imaging: Pitfalls and Classic Signs of the Abdomen and Pelvis, written by leading experts, Dr. Khaled M. Elsayes, Dr. Akram A. Shaaban, and their team, provides practicing radiologists and radiology residents with the level of knowledge necessary to avoid misinterpretation and help make precise diagnoses in the presence of certain classic pathognomonic features. Uniquely written from a practical point of view, each case leads you through a radiology expert’s thought process in analyzing imaging pitfalls and classic signs of the abdomen and pelvis. The cases highlight clinical presentation, relevant pathology, anatomy, physiology, and pertinent imaging features of common disease processes. As with all Amirsys references, information is distilled into succinct, bulleted with detailed illustrations and thousands of images. Coupled with a companion eBook, this volume is an irreplaceable reference for anyone confronted with the challenges of imaging in the abdominal and pelvic areas.